Greenwich Mean Time, or GMT, is the global time standard that is the mean solar time anywhere along the Greenwich Meridian. Because noon (the time when the sun is the highest overhead) does not occur at exactly the same point in every twenty-four day during the course of the year, we use the average ("mean") of each apparent noon as a standard that is called mean solar time. 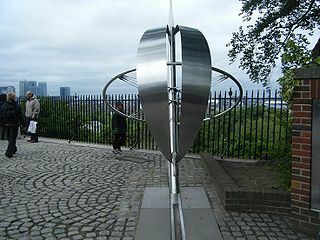 The Greenwich Meridian (Prime Meridian or Longitude Zero degrees) marks the starting point of every time zone in the World. Physically, it is marked by a brass bar and accompanying symbol in the forecourt of the Museum which replaced the original Royal Observatory at Greenwich in south-east London. The meeting of the hemispheres - East is right, West is left. For every 15˚ change in longitude away from the Prime Meridian, there is one hours' difference in local time, compared to that at Greenwich. Towards the east of Greenwich, the local time will be ahead of GMT, whilst to the west, local time will lag GMT. This has not only resulted in the world being divided into 24 time zones, but also large land masses and individual countries being divided into several time zones. Although GMT has been replaced by atomic time (Coordinated Universal Time or UTC) it is still widely regarded as the correct time for every international time zone. Allowance also needs to be made for Daylight Saving Time, or Summer Time Zones, where applicable, which include an offset of an extra hour. The International Date Line is an imaginary line running approximately between time GMT+12 and GMT-12, that separates two consecutive calendar days. The date in the Eastern hemisphere, to the left of the line - time zone M (Mike)- is always one day ahead of the date in the Western hemisphere, to the right of the International Date Line - time zone Y (Yankee). This page was last modified on 20 March 2017, at 13:47.